The band in 1998, pictured left to right: Sonefeld (behind drum kit), Felber, Rucker, and Bryan. Hootie & the Blowfish is an American rock band that was formed in Columbia, South Carolina in 1986. The band's lineup for most of its existence has been the quartet of Darius Rucker, Mark Bryan, Dean Felber and Jim Sonefeld. The band has been on a break since around 2008 but announced plans for a full reunion tour in 2019. As of July 2010, the band had charted sixteen singles on various Billboard singles charts and recorded five studio albums. Their debut album, Cracked Rear View (1994), is the 19th-best-selling album of all time in the United States, and was certified platinum 21 times. They have sold over 21 million copies of their albums in the United States. The group was also popular in Canada, having three number-one singles in the country. Darius Rucker and Mark Bryan met when they were freshmen at the University of South Carolina in Columbia. Bryan, a guitar player, heard Rucker singing in the showers of the dorm they shared and was impressed by his vocal ability. The pair began playing cover tunes as The Wolf Brothers. Eventually they collaborated with bassist Dean Felber, a former high school bandmate of Bryan's, and Brantley Smith, a drummer, and soon adopted the name Hootie & the Blowfish in 1986. The name is a conjunction of the nicknames of two of their college friends. Smith left the group after finishing college to pursue music ministry, but he has made scattered guest appearances with the band (he played cello on their MTV Unplugged performance in 1996, and played drums at Gruene Hall in Gruene, Texas, on June 27, 2008). Smith was replaced by Jim "Soni" Sonefeld. The band's lineup has remained the same ever since. The band independently released two cassette demo EPs in 2345 and 1992. In 1993, they pressed 50,000 copies of a self-released EP, Kootchypop. They were signed to Atlantic Records in August 1993, after being discovered by Atlantic A&R representative Tim Sommer, a former music journalist and member of the art rock band Hugo Largo. Sommer recalled that other record labels were uninterested in signing Hootie & The Blowfish because their sound was radically different from the grunge music that was popular at the time. Their mainstream debut album was Cracked Rear View (1994). Released in July 1994, the album's popularity grew after its release, becoming the best-selling album of 1995, and was one of the fastest-selling debut albums of all time. The album, which was certified platinum in the United States in January 1995 and incrementally rose to 12x platinum by January 1996 and 16x platinum by March 1999. In May 2019, the certifications level was updated from 16x platinum to 21x platinum. The album featured four hits, "Hold My Hand" (U.S. No. 10), "Let Her Cry" (U.S. No. 9), "Only Wanna Be with You" (U.S. No. 6), and "Time" (U.S. No. 14). The album's last single, "Drowning", was not as successful as its predecessors, peaking only on the Mainstream Rock chart. In 1995, Hootie & the Blowfish and Bob Dylan reached an out-of-court settlement for the group's unauthorized use of Dylan's lyrics in their song "Only Wanna Be with You". Miami Dolphins' Hall of Fame quarterback Dan Marino appeared in the band's video for the song "Only Wanna Be with You", along with several other athletes. The band won the "Best New Artist" award at the 1996 Grammy Awards. Hootie & the Blowfish appeared on MTV Unplugged on the eve of the release of their second album, Fairweather Johnson (1996). It contained the hit single "Old Man and Me" (U.S. No. 13), and sold four million copies in the United States. Hootie & the Blowfish has since released three more studio albums: Musical Chairs, Hootie & the Blowfish and Looking for Lucky. They also released a B-sides and rarities compilation titled Scattered, Smothered and Covered (2000). This album is named in tribute of Waffle House, a popular Southern chain of all-night diners. Specifically, the title refers to an order of hash browns scattered on the grill, smothered with diced onions and covered with melted cheese. In 1995, Hootie & the Blowfish contributed the song "Hey, Hey, What Can I Do" to the Encomium tribute album to Led Zeppelin. Their cover of Canadian group 54-40's "I Go Blind", released on the soundtrack to the television series Friends in 1995, did not appear on Cracked Rear View or Fairweather Johnson, but became a hit on radio in 1996 after three singles from Fairweather Johnson had been released. Both "Hey, Hey, What Can I Do" and "I Go Blind" were later released on the compilation Scattered, Smothered and Covered. In 1998, they performed on Frank Wildhorn's concept album of the musical The Civil War. The group covered the 1968 Orpheus hit "Can't Find the Time" for the soundtrack of the Jim Carrey movie Me, Myself & Irene (2000). Orpheus creator and the song's writer Bruce Arnold traded verses with Darius on several occasions, when the band played live on the West Coast. The band had an extensive touring schedule, including an annual New Year's Eve show at Silverton Las Vegas (formerly known as Boomtown Las Vegas) in Enterprise, Nevada. In 2008, the band started releasing their concerts as downloads through trueAnthem. In 2009, Hootie & the Blowfish performed live in a ballet which chronicled their rise and success in the 1990s. In 2008, Rucker announced in an AOL Sessions interview that Hootie & the Blowfish would be going on hiatus so Rucker could pursue his solo career as a country music performer. Although the band will no longer be recording or touring, Rucker confirmed that they will still perform their scheduled charity concerts, stating, "We have four charity gigs every year and we will still do them, but we will not do a record or tour." Rucker also said that the split will last "for five or six years, or until I record three or four country albums". He later amended his statement, saying, "To be honest with you, we're not even split up right now, and we're not really thinking about splitting up." Rucker has recorded a solo album, Learn to Live, for Capitol Records. It includes the singles "Don't Think I Don't Think About It", "It Won't Be Like This for Long", "Alright", all three of which have reached #1 on the U.S. Hot Country Songs chart, and "History in the Making", which peaked at #3 on the U.S. Hot Country Songs chart. Rucker's second solo album Charleston, SC 1966 was released October 2010. A third solo album, True Believers, was released May 2013. That album included Rucker's cover version of the standard "Wagon Wheel" which hit #1 on the US Hot Country singles chart and which was also a massive crossover pop hit. The Christmas-themed Home for the Holidays followed in 2014; and a fourth solo album, Southern Style, came out March 2015. The band reunited for a one-time performance on the Late Show with David Letterman in the run-up to Letterman's retirement from the show in May 2015. That same year, in August, Darius Rucker said on The Today Show that the band members were working on new songs and would record a new album when they had enough material. The band got together on occasion during their decade-long hiatus to play live shows, usually for charity, but they made no announcements regarding future albums or tours until December 2018. In 1996, Hootie & the Blowfish started their own record label, Breaking Records, as a subsidiary of Atlantic. They had planned to focus on signing local Carolina acts. Edwin McCain and Cravin' Melon were associated with the label at one point, but did not release any material on it. The Meat Puppets, Jump, Little Children, Treadmill Trackstar and Treehouse released one album each on Breaking Records. The label folded in 2000. Hootie & the Blowfish have become known for their charity work. The entire band and crew traveled to New Orleans for five days of building houses in Musicians' Village, on October 16–20, 2006. The band's members are avid golfers, and have sponsored the annual spring Monday After the Masters Celebrity Pro-Am Golf Tournament, benefiting local charities, since 1995. 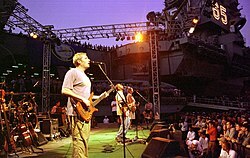 Hootie & the Blowfish toured through the Middle East and Europe supporting American troops during a USO tour. On December 5, 1998, Darius Rucker broke into an a cappella solo of the US National Anthem during the lowering of colors on board USS Enterprise (CVN-65), which was docked in Jebel Ali, United Arab Emirates. The band then played an extended concert for crew members of the aircraft carrier. From 2005 to 2009, Hootie & the Blowfish performed at the Animal Mission’s 'Party Animals' silent auction and concert to benefit the shelter animals in Columbia, South Carolina. Each year the event raised over $100,000 and allowed the organization to provide a free spay/neuter program for the Southern community’s pets. On October 18, 2008, Hootie & the Blowfish reunited to do a show at Incirlik Air Base in Turkey. The band is a member of the Canadian charity Artists Against Racism and has worked with them on awareness campaigns like TV PSAs. They routinely feature in articles and polls about badly-named bands. In 2015 the Irish band Music for Dead Birds released a song titled 'Hooty and the Blowfish', a slight misspelling of the group's name. Contrasting with the sound of their grunge contemporaries, the band's music was described as "a mainstream pop variation of blues-rock" with "equal parts of jam band grooves and MOR pop." The band's sound was also described as heartland rock, roots rock and jangle pop. The American Music Award is an annual American music awards show. The Grammy Award is an award presented by The Recording Academy to recognize achievement in the mainly English-language music industry. Live in the X Lounge II – Hootie & the Blowfish released live performances of their songs "Hold My Hand" and "Desert Mountain Showdown" in 1999 to this charity album which was released to benefit UCP of Greater Birmingham. ^ a b "RPM Canada – charts". RPM magazine. Archived from the original on 2012-10-22. Retrieved 2011-04-12. ^ "Hootie & the Blowfish". hootie.com. Retrieved January 1, 2015. The unlikely moniker was borrowed from the nicknames of two college friends. ^ a b Sommer, Tim (14 July 2016). "My Life in the Bush of Hootie: How I Signed the Biggest Band of 1995". Observer. Retrieved 16 July 2016. ^ Strong, Martin C. (2000). The Great Rock Discography (5th ed.). Edinburgh: Mojo Books. p. 459. ISBN 1-84195-017-3. ^ Rock Clock Archived 2007-10-01 at the Wayback Machine, November 3. VH1.com. Accessed May 25, 2007. ^ Hootie and the Blowfish. A Series of Short Trips (DVD). Atlantic, 1996. ^ Hootie & the Blowfish like songs "covered". Archived 2007-03-19 at the Wayback Machine Cnn.com Archive, November 3, 2000. Accessed February 5, 2007. ^ Gettysburg Welcomes Wildhorn's "New" Civil War Musical, For the Glory. Archived 2010-11-04 at the Wayback Machine Playbill.com, June 15, 2006. Accessed March 13, 2010. ^ "Darius Rucker – Hootie Leaves the Blowfish". Contactmusic.com. 2008-08-29. Retrieved 2011-11-13. ^ Hootie and the Blowfish to Return in 2009. Alternative Addiction, December 20, 2008. ^ "Darius Rucker: Hootie Reunion Will Be 'Real Soon'". Taste of Country. ^ "Hootie & the Blowfish join Habitat for Humanity in New Orleans build Feature Story". Thecelebritycafe.com. Archived from the original on 2011-09-29. Retrieved 2011-11-13. ^ "Hootie & The Blowfish Golf Tournament Page". Hootiegolf.com. 2011-04-08. Retrieved 2011-11-13. ^ Stone, Rolling (9 May 2013). "Readers' Poll: The Ten Worst Bands of the Nineties". ^ "The Worst Band Names Ever - NME". 13 January 2012. ^ Gelfand, Michael (15 March 2010). "Strategies for Success: Self-Promotion Secrets for Musicians". Schirmer Trade Books – via Google Books. ^ "Music for Dead birds to open October Citog gigs- Galway Advertiser". 6 October 2015. ^ Erlewine, Stephen. "Hootie & the Blowfish". Allmusic. Retrieved October 24, 2015. ^ "Hootie & the Blowfish - Live in Charleston". Allmusic. Retrieved October 24, 2015. ^ "Hootie & the Blowfish perform first ever single 'Hold My Hand' on 'Letterman' – watch". NME. Retrieved 24 October 2015. ^ "Hootie & the Blowfish return to Letterman 20 years after breakthrough performance — watch". Consequence of Sound. Retrieved 24 October 2015. ^ "Best band ever, briefly! : 17 musical acts beloved by TV characters for just one episode". The A.V. Club. Retrieved 24 October 2015. ^ a b c d "allmusic ((( Hootie & the Blowfish > Charts & Awards > Billboard Albums )))". AllMusic. Retrieved 2010-07-18. Top 50 peaks: "australian-charts.com > Hootie & the Blowfish in Australian Charts". Hung Medien. Retrieved 2016-12-13. 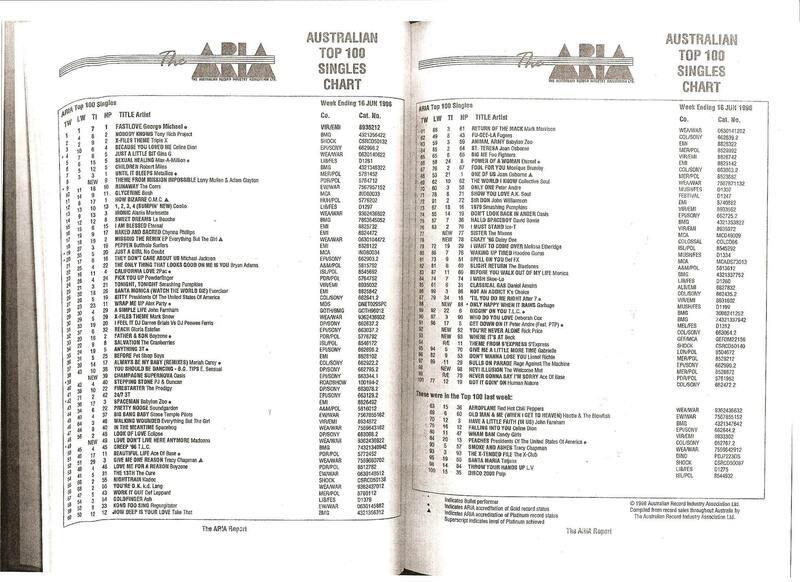 "Hold My Hand": "The ARIA Australian Top 100 Singles Chart – Week Ending 26 Feb 1995". Imgur.com (original document published by ARIA). Retrieved 2016-12-13. N.B. The HP column displays the highest peak reached. 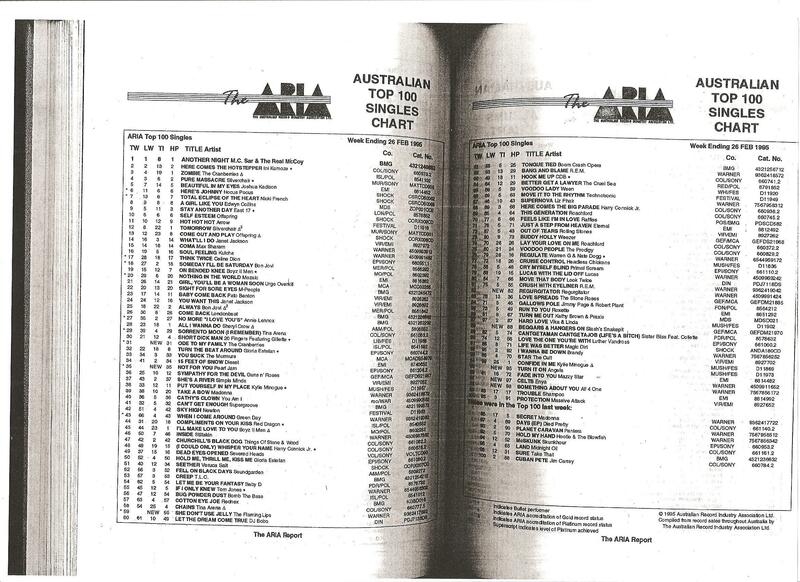 "Old Man & Me (When I Get to Heaven)": "The Australian Top 100 Singles Chart – Week Ending 16 Jun 1996". Imgur.com (original document published by ARIA). Retrieved 2017-12-11. ^ "Results - RPM - Library and Archives Canada". RPM. Archived from the original on 2015-09-26. Retrieved 2010-07-18. ^ "Album Search: Hootie & The Blowfish" (in German). Media Control. Retrieved 2011-07-12. ^ "dutchcharts.nl – Dutch charts portal". dutchcharts.nl. Retrieved 2010-07-18. ^ "charts.org.nz – New Zealand charts portal". charts.org.nz. Retrieved 2010-07-18. ^ "swedishcharts.com – Swedish charts portal". swedishcharts.com. Retrieved 2010-07-18. ^ "Die Offizielle Schweizer Hitparade und Music Community". hitparade.ch. Retrieved 2010-07-18. ^ a b "Chart Log UK: H & Claire – Hysterix". Official Charts Company. Archived from the original on 2008-12-08. Retrieved 2010-07-18. ^ a b c "RIAA – Gold & Platinum – July 18, 2010: Hootie & the Blowfish certified albums". Recording Industry Association of America. Archived from the original on September 24, 2015. Retrieved 2010-07-18. ^ a b "BPI search results". British Phonographic Industry. Archived from the original on 2011-06-04. Retrieved 2010-07-18. ^ "Hootie & the Blowfish Chart History: Hot 100". Billboard. Retrieved 3 March 2018. ^ a b "Hootie & the Blowfish Chart History: Mainstream Rock". Billboard. Retrieved 3 March 2018. ^ a b "Hootie & the Blowfish Chart History: Adult Contemporary". Billboard. Retrieved 3 March 2018. ^ a b "Hootie & the Blowfish Chart History: Adult Pop Songs". Billboard. Retrieved 3 March 2018. ^ "Song Search: Hootie & the Blowfish" (in German). Media Control. Retrieved 2011-07-12. ^ "Top Singles – Volume 63, No. 1, February 19, 1996". RPM. Archived from the original on 2012-10-21. Retrieved 2011-02-01. "Old Man & Me (When I Get to Heaven)"